Conventional wisdom maintains that neutral colors are the best way to go when you’re dealing with a home’s interior. If you’re planning to sell, this may be true. However, if you’re planning on staying in your home for a longer time, you want to make sure that you choose colors that help you live better. After all, a home is about living well, and you can always change the paint when you’re ready to leave. Once you’ve decided to improve your mood through enhanced color in your home, it’s time to decide what you want to achieve in each room. Orange is great for a dining room where you may want to encourage eating and conversation. Yellow is great for a children’s room or kitchen. It reminds people of the sun and is best used sparingly. 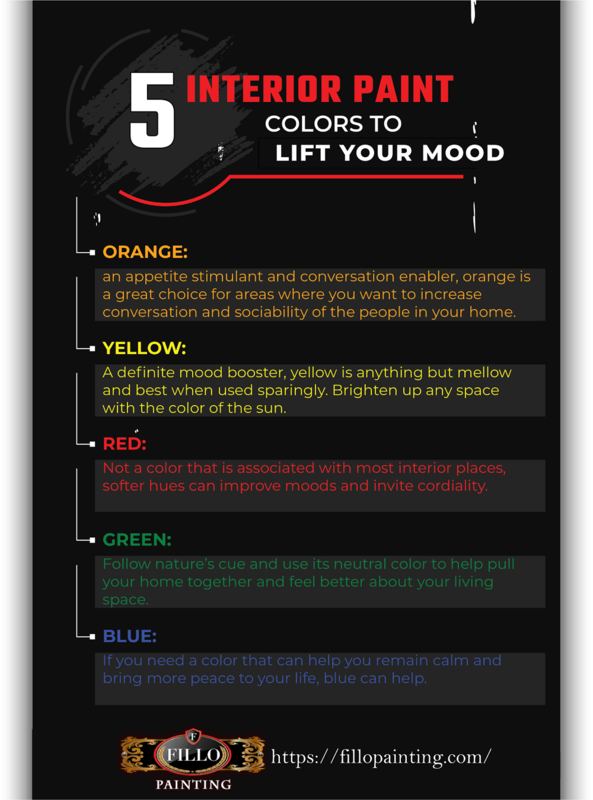 Both colors are vibrant and will help your mood be better. Red is associated with passion, love, revenge, and other exciting emotions. In its pure form, you may not want to use it in a bedroom. However, choose a muted tone of red, and you could find that your energy increases slightly and your mood improves. Nature uses green in the background to offset the colors of flowers and fruits. It is the neutral color that the environment has chosen to provide people and animals the opportunity to better view the beauty nature has to offer. In the home, it also reflects growth and improvement. Blue can help you improve your mood through its ability to increase the meditative qualities of an area. The soothing influence of blue helps you remain calm and gain perspective. The color isn’t the only thing you should consider when painting your home’s interior. At Fillo Painting, we understand that how long the paint job will last and how it’s done is just as important as the color you choose. Our friendly staff is ready to help you get the results you want and to get the most out of your painting budget. Don’t go another day without using color in your home to improve your mood. Contact us to schedule an appointment and get an estimate for the job you have in mind. We’ll keep the work place clean and get the job done quickly.